I had an opportunity to do a demo for an LCC photo class this week. Thanks to Camilla Dussinger and her students for a wonderful time exploring HDR photography and playing with a my 24mm Tilt-Shift lens. I had an opportunity to review some of my old LCC work. The picture to the right was taken for Essex Construction quite some time back. 2010? 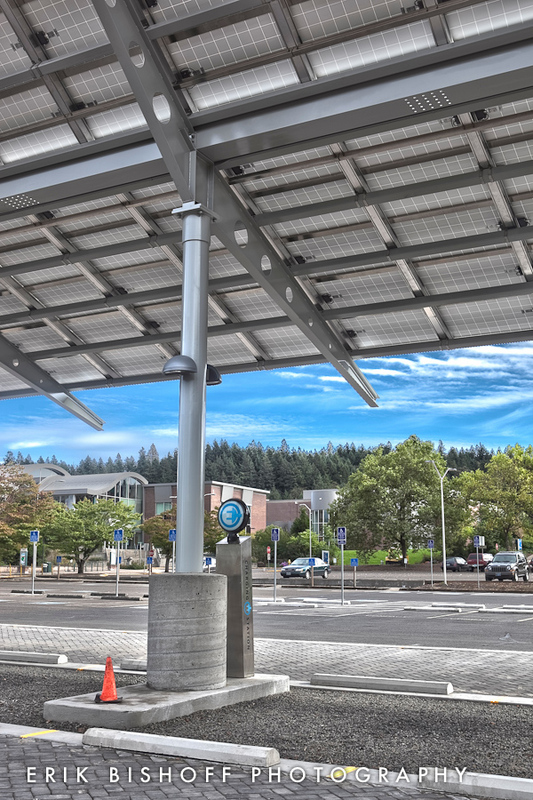 Lane Community College has an impressive solar array with e-car charging stations. I shot these images with a heavy-HDR (not typically how I shoot today) that illustrated the "techy" elements quite well. That being said, I think I might revisit the solar array with and try capturing it with some more practical techniques. Maybe a twilight shot. LCC Solar Array photographed for Essex Construction by Erik Bishoff Photography - Architecture Photographer in Eugene Oregon.